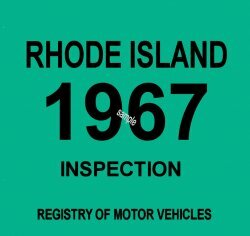 1967 Rhode Island Inspection Sticker - $20.00 : Bob Hoyts Classic Inspection Stickers, Add a Final Touch to your Restoration! The first Rhode Island Inspections were probably started in 1947. The originl was issued in 1967 and expired in 1968.